I have been knitting a lot for a friend who is having a baby girl. 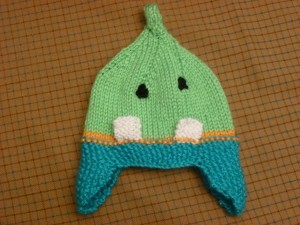 So I get to knit all those cute things that I have always wanted to do, but had no excuse to do. But…. since they are a gift you guys don’t get to see them until my friend does. But I will share them with you, I promise. We got the totals from the book fair- our sales were $6,800 up over a thousand dollars from last year of $5,500. Those are a lot of books! I have contributed 3 original knitting patters to Ravelry. So far the response has been good. 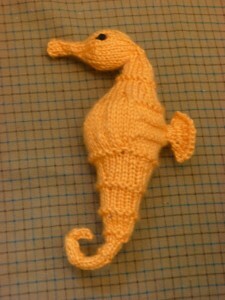 I have had 85 people add the seahorse to their favorites and 55 people add the elephant head lovie. So it is my son’s book fair week- which means I took a week of vacation and will work the book fair to help out his school. This means my posts will suffer a little. 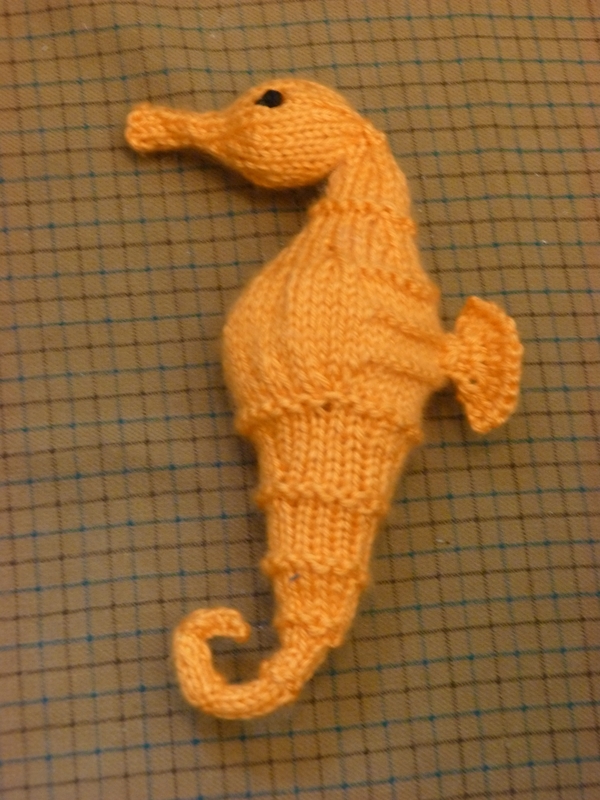 I have added a new knitting pattern… the seahorse. Making a terrarium is easy and cheaper than you think. Each plant 2.95 at a home improvement store, rocks 1.00 at a dollar store and glass easy to find at a thrift store. 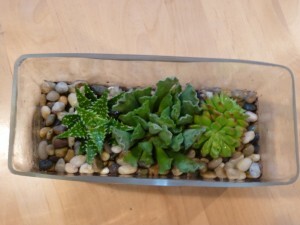 Online instructions say you need cactus soil, but cactus soil is just like potting soil with extra sand. 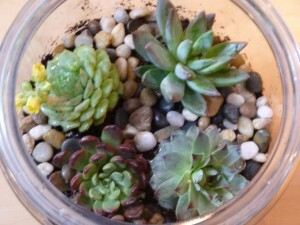 I had potting soil, and play sand, so I mixed to too to get a good consistency. 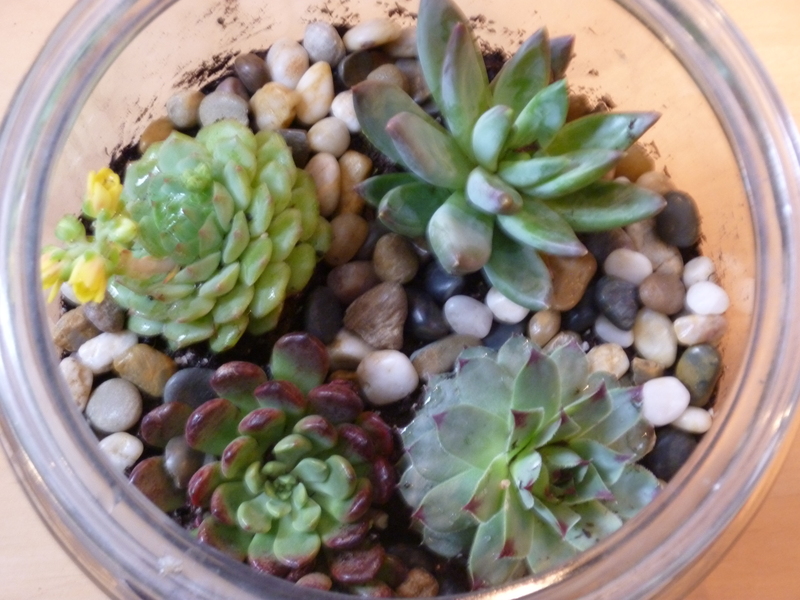 Succulents need lots of drainage so add rocks to the bottom of your glass. I found pebbles at a dollar store for a dollar a bag and I used 1.5 bags. One bag for the bottom, and less than that for the top to give it a finished look. I ended up making two. The second one cost me a grand total of $13. 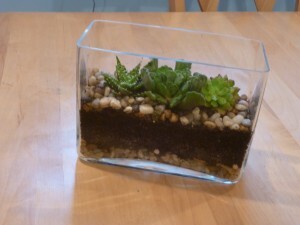 $2.00 for the rectangular vase from a thrift store, $9.00 worth of plants, and $2.00 of rocks. 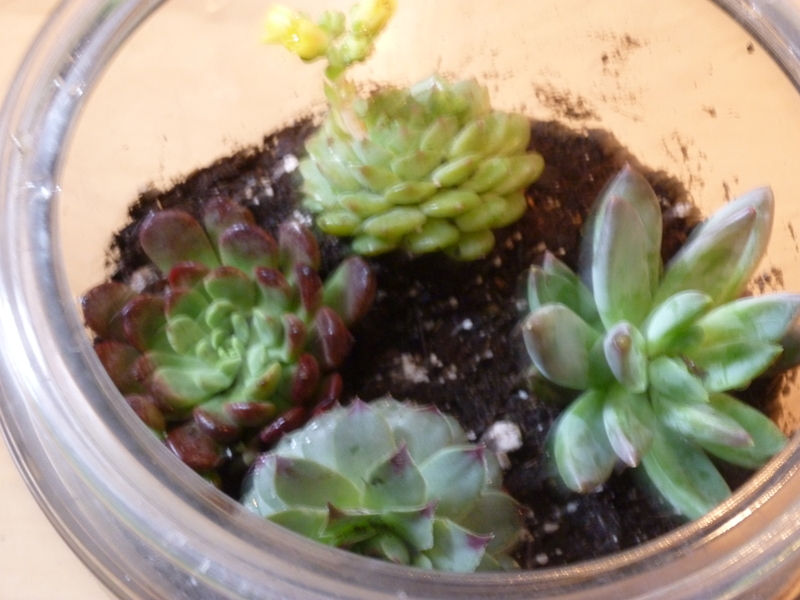 I had the sand and potting soil already. So I have always loved glass doors in vanities an cabinets. But they show the mess! 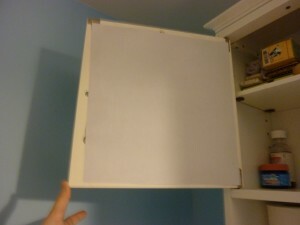 So I decided to put paper in the doors to hide the clutter. I tried out various colored paper before I settled. These are scrap book papers. The one below almost matches the color of the walls until it is behind the glass. And then it is way too pale. Once you settle on a paper, trim to size and tape into place with scotch tape. Then admire the view! It took only 30 minutes to do, the hardest part was selecting the paper, and .20 worth of materials. 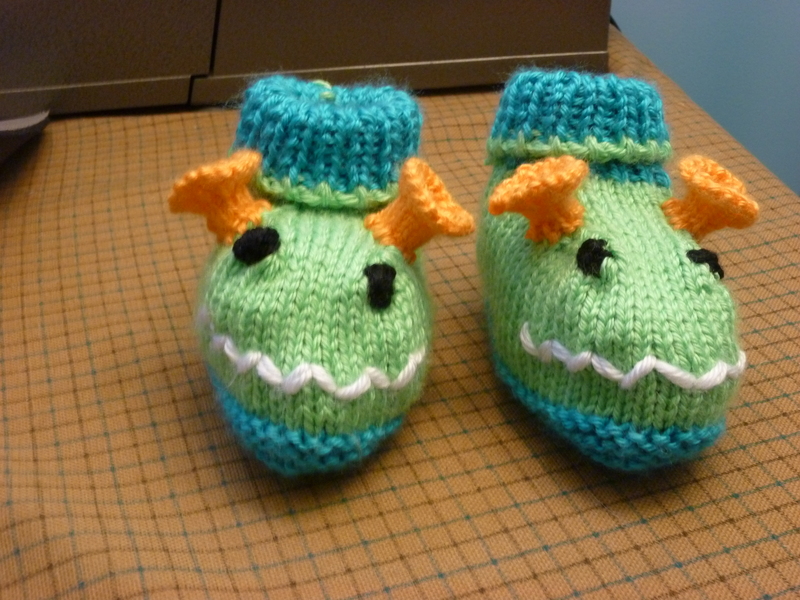 One of my work friends is having a baby so I have been knitting for her. I made a monster hat and booties from Rebbecca Danger’s knit a monster nursery. So cute! 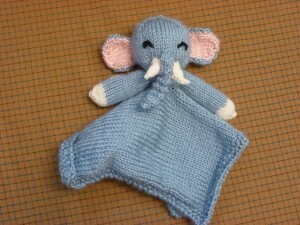 I also create a pattern for an elephant lovie. I made two so she would have a spare. I do a lot of thrift store shopping. I dislike shopping in general, but the thrill of the hunt, and the bargain make me love thrift store shopping. Find the sales: Stop by every day of the week or ask the clerks what the sales are. Different days might have different items on sale. The one near my house has Sundays’ as 3 for a dollar. It took me forever to figure that out. Another has Saturday .69 sales. Do they have shipment days? If they have shipment days show up on that day or the next to find the best stuff that hasn’t been picked through yet. Be picky- but flexible. Don’t buy something just because it is there. If it is worn, has rips and holes, or stains, then pass it up. There will be something else, if it is cheap junk, it is still junk. But be flexible- look at the potential of everything. Sheets, towels, blankets and other household linens make great yardage. It might not be what you were expecting, but it can still be great. Know what you have. I keep a list of the clothes I have bought for my son in a certain size in my purse. That way I know if I have enough long sleeved shirts or if I should pick up a few more. Keep a list of what you are looking for in your purse. You never know when you might stop at a thrift store. Know what you are looking for to be sure to check out those areas. Thinking of furniture? Keep a list of measurements AND measuring tape in your purse. If you find that perfect item you want to make sure it is really perfect and it fits the space. In the same token you don’t want to have to pass up a great find just because you don’t know if it will fit. Shop frequently. You never know what the store will have, and what great item will come up. I shop at thrift stores twice a week, but I am just as likely to walk out with nothing as to come home with a couple of treasures. Establish your Stash: Storage and on a budget too! Once you have your stash and are attempting to organize it you then need containers to hold your items in the categories you devised. You can spend a lot of money on these containers, but I would rather spend my money on my stash and not the containers. You will have to make some large purchases, but hopefully these will be used for years to come and you get something versatile enough to evolve as your stash and space does. Small container storage for beads, buttons, and notions: clear is the best type of storage, that way you don’t have to open up the package to see what you have. Free containers can be assembled from reused food storage you have in your home. These days baby food is sold in small see through tubs with a snap on lid. Save all of these, or hit up your friends and children with little ones to save them for you. Peanut butter jars are plastic and a nice option. I have my button collection in different sizes of glass jars such as pasta sauce, pickles, and a vintage Skippy jar. 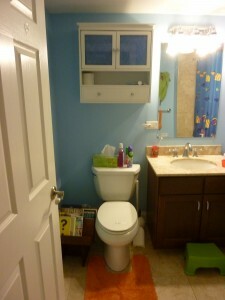 Think outside the craft store- there are nice storage options in the craft store, but they are expensive. Tackle, tool, and fastener storage from the sporting goods store or the home improvement store make great drawers or bead trays. Plastic bins: You want them in a variety of sizes, shoe box sized and larger for your various stash. Instead of writing on the bin use a note card and place it in the front of the bin with the contents. As your stash evolves you can switch out the label without pealing off tape or covering over writing. These can get pricey so you want to get the most of your money. Shop your house: What do you have around the house that you can use? 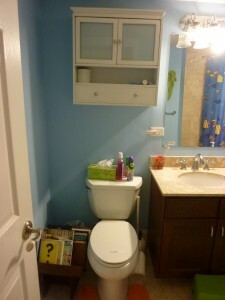 An old dresser, book shelf, or containers? These can be re-purposed as is or you can do a little repair and sprucing up (a great project opportunity!) to fit your craft space. Our first apartment table is small but has been reinvented many times as desk, computer table, extra seating for large family gatherings, and craft table. I probably won’t ever let that go.